I am proud to announce I've had my first sucessful Through-The-Mail autograph success, and it is a legit signature! 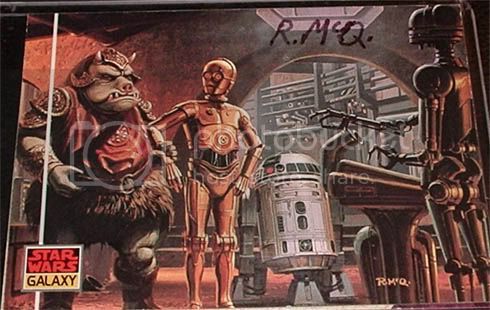 I wrote to Ralph McQuarrie a couple weeks ago, and I got my SASE back and there be my two cards autographed! That's awesome, and you got it personalized! I'm jealous. 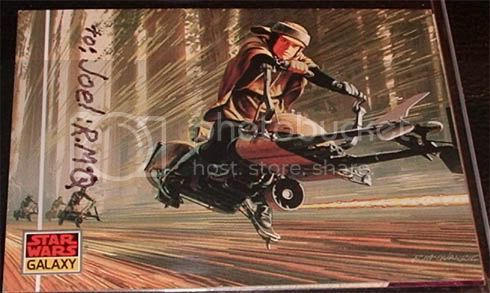 I got a response from Mr. McQuarrie today. I received both of my trading cards back, signed R.McQ. Not sure where my index card went, but I'm happy with the response. Took approx. 30 days. 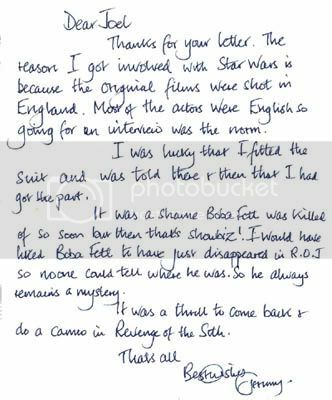 And today I got an awesome success, one that I am most pleased with and surprised that Jeremy Bulloch took time to write me a letter back. That's great! That's so nice of him to write a real letter. Very cool Joel. When I met him in Shreveport 2001 I thanked him in person for signing stuff via mail for me. We chatted for a while and he asked if the letter I received was hand-written or typed. If it's typed, his secretary helped get it ready and he signs it. If it's hand written he had the time to sit down and write a personal response. That is so cool. I want one! Cool guy for sending that letter. To bad I missed him when he was here last year for a convention. 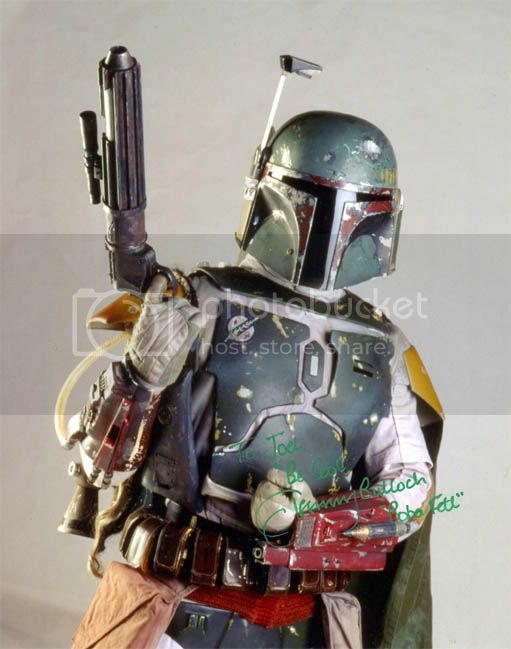 But as everyone knows....Fett made it out of the Sarlacc So no worries. Ya, but that was in response to one of my questions I had asked him my letter in regards how he'd like to see Fett meet his fate in RotJ. I received a Miranda Otto (Eowyn from LOTR) autograph through the mail today. I was beginning to doubt she'd sign, as she doesn't sign often. Luckily, she sems to be going through all of her fan mail this week. Took 2 months and 4 days, via a theater in Sydney she was performing at. Way to go DS! I was starting to get worried for you as I saw everyone else but you get successes at that event. But now you've finally got it! Unfortunatly my streak of over 2 months without a success for my requests continues on. Now if those Battlestar Galactica cast members would sign! My latest one is from Terry McGovern, the voice of some of the Stormtroopers in ANH, he also spoke the famous line of "These are not the droids we're looking for."